There was a total mess on US-59 in Corrigan when the driver of an 18 wheeler didn't pay attention to stopped vehicles in front of him. 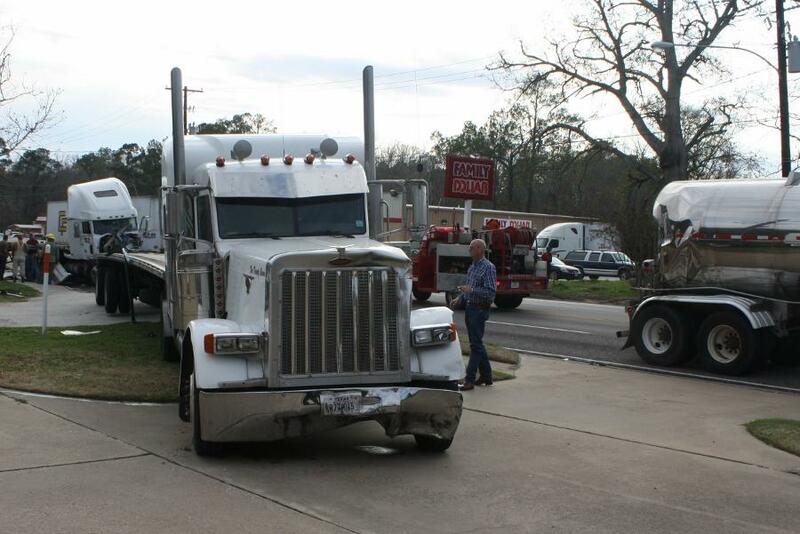 Four 18 Wheelers and a Van Crash on 59, CORRIGAN, January 30, 2012 - At approximately 2:30 pm on January 30, 2012, an 18 wheeler driven by Misael Garcia, Jr, 31, of Texas City, was north-bound on US-59 entering Corrigan. Garcia was coming too fast and not paying attention to the traffic in front of him. Garcia slammed into an 18 wheeler that was in front of him stopped at a light. This set off a domino effect involving Garcia and three other 18 wheelers and a gray Dodge van. The collision sent Garcia's front end off the pavement to the right where he grazed a house, the 18 wheeler in front of Garcia that was slammed ended up with it's trailer propped up on Garcia's truck. The Dodge van, driven by George Thomas, 60, of Livingston was crunched between the a18 wheeler behind him and the trailer of the 18 wheeler in front of him. That 18 wheeler slammed the back of a tanker 18 wheeler in front of him. Americare Ambulance Service was dispatched to the scene along with Officers from the Corrigan Police Department including Sergeant Chris Molandes and Police Chief Ray Stubbs. Additionally 2 Troopers were dispatched to assist including Trooper Brent Henry and Sergeant Nita Bowen. The major concern was George Thomas (gray Dodge van). Thomas' van was a mangled piece of steel crunched on the trailer of the 18 wheeler in front of him. The Corrigan Volunteer Fire Department Cut the top off of Thomas' vehicle to free him from the wreckage. Emergency personnel loaded Thomas onto an ambulance and he was flown from the scene by a PHi Air Medical helicopter that transported him from a nearby landing zone. Amazingly, Thomas' injuries appeared to be non-life-threatening. Misael Garcia was cited for failure to control speed. The 18 wheelers and the van were recovered by Riley Wrecker Service and they will be stored in Corrigan. The scene was cleared by 6 pm. Misael Garcia (right) looks over the wreckage he caused from not paying attention to his driving. Emergency personnel work to free 60 year old George Thomas from his totally mangled van. Thomas was loaded onto an ambulance and driven to a nearby landing zone where he was flown out by helicopter. This is what Thomas' van looked like after it was crunched between two 18 wheelers. This is the 18 wheeler that was knocked into Thomas' van, knocking Thomas into the 18 wheeler in front of him. This is the back of the 4th 18 wheeler. Corrigan Police Chief Ray Stubbs (left) assisted in sorting out the mess. Misael Garcia was cited by Sergeant Chris Molandes for failure to control speed. Molandes is the investigating officer. Trooper Brent Henry specializes in commerical vehicles and 18 wheelers. Henry assisted Corrigan PD. Misael Garcia talks on his cell phone. His truck is pictured at right. Garcia's rig grazed this house. George Thomas' van was loaded onto this rollback wrecker.